The traditional Beer Festival Season is now well and truly upon us. Part of the trend of new ‘craft beer’ oriented events is their desire to do things differently, and be in different places than other beer festivals. The term ‘pop-up’ is often bandied about liberally, when people really mean ‘tent’ or ‘stall’. 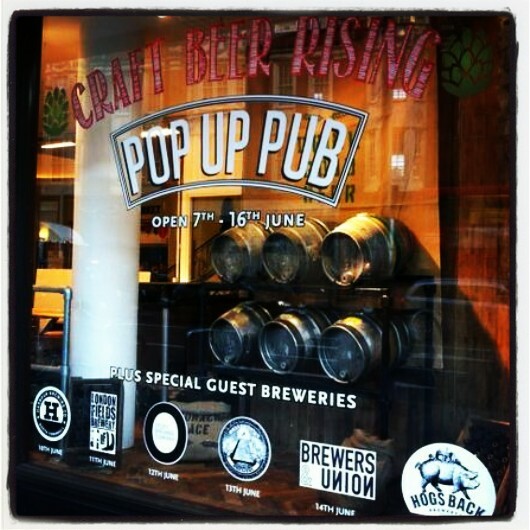 With respect to Craft Beer Rising, setting up a small pub in the window of Whole Foods in High Street Ken is more than just a stall. From the 7th to the 16th of June, this is exactly what they did. Again, they managed to get all the right people involved. Brewers as different at Harbour, Otley, Beavertown and Hogsback all had their beers stocked in the pop-up pub, with their beers matched to foods from the Whole Foods market at events from Monday to Friday last week. Each night, the brewers themselves would guide paying customers (at £20 a ticket) through six of their beers and foods matched to them by either Melissa Cole or Ben McFarland. On Wednesday, I attended the evening hosted by Otley Brewing Co, a favourite Welsh brewer of mine who consistently turn out innovative, flavoursome but impressively balanced beers. Melissa Cole (who has brewed a collaboration beer with Otley, in the form of Thai-Bo) had made the beer and food matches, and talked the attendees (some of whom were in the industry, others enthusiasts, or complete novices) through the basics of beer, brewing and food matching. Nick and Lee from Otley were there to talk about the process of making each beer, and the whole event had a very intimate and friendly atmosphere, partly due to the slightly cramped confines of a pop-up pub (see photos). We were greeted warmly on arrival and handed a glass of Croeso (O2), Otley’s US-hopped golden ale, fresh from the cask. It’s a deeply aromatic beer for its modest strength (4.2%), and was the winner in the Champion Beer of Wales/Golden Ales category last year. The tropical fruit nose converts neatly onto the palate, and makes for an extremely moreish beer, leagues ahead of other far blander golden ales. Whilst this wasn’t paired with anything per say, there was some crunchy, spicy corn on the tables to go with it. A bar snack basic, but still pleasant enough. Lined up on the (slightly wobbly) tables were several bottles of five other Otley beers. As we took our seats on cushion-topped metal casks, we were introduced to Nick and Lee, and Melissa introduced the beers one by one with each food accompaniment. First was O1, Otley’s original golden bitter. It was paired with some puff pastry cheese twists: a simple but extremely effective combination. O1 has a surprisingly zesty, lemon-and-orange-pith character to its straightforward sweet-then-bitter profile, which paired very nicely with the pastry to become liquid bread. The cheese was lifted neatly right off the palate, but its flavour remained. Classic and simple. Next came O9 (formerly known as O-Garden, but has had its name changed after a polite request from you-know-who), which was just as sharp, citrusy and spicy with cloves as I remember. This was paired with some fish and chips with tartar sauce. Aside from the expected batter-melting quality of the carbonation and clean, fruity finish to every bite, the O9 went quite splendidly with the tartar sauce, with its lemon tartness and spicy clove character adding new depths to the sauce. Afterwards we had Oxymoron (O10), Otley’s rather aptly-named black IPA. Most black IPAs I’ve tasted are in the 6-7%, but Oxymoron is only 5.5%. However, it was Oxymoron that really hit home to me what Otley’s real strength is as a brewer: balance. All that roast, syrup, citrus and dryness is blended into what I can only describe as a sessionable and extremely balanced palate. If there was ever an accessible black IPA to introduce beer newbies to the style, this is it. Oxymoron was served with a selection of breads, charcuterie and small gherkins. Naturally, it work very nicely, cutting through oily and salty meat and adding smoky sweetness, binding with the bread and sweetening the gherkins. The penultimate beer of the night is my favourite Otley beer: their O6 Porter. The bottled version of the beer is not quite as good as it is on cask, but it’s still a rich, chocolatey, espresso-powered beast that, for its 6.6% abv, remains gulpable. This came with some mini-brownies topped with salted caramel. Naturally this enhanced the flavours in both things, but I might have preferred to see the O6 with a rich meat course to see how it faired. Finally, we tasted Motley Brew, a 7.5% double IPA brewed in collaboration with Glyn Roberts aka Rabid Barfly. Again, for all its intense flavour and high strength, it’s a remarkably balanced beer that never overpowers any section of your palate. You never get bored of its assertive tropical fruit sweetness or dry, piney finish. You just keep enjoying it, over and over again. This was served with some delightfully named Ticklemore cheese and chilli focaccia bread. The cheese was mostly dry and chalky in the middle, but the beer made it sweeter, creamier and saltier, like injecting it with a super-soldier serum. It also went marvellously with the chilli bread, allowing the heat to tingle the taste buds before sweetening the bread and cleansing the palate. It was a great night, and I’ve heard positive things about the other brewer evenings. Melissa did a great job of concisely conveying lots of information about the beers, brewing, food and anecdotes to an audience of mixed levels of knowledge, and both her and the Otley team fielded plenty of questions. My only criticism would be the size of the venue. Whilst it looked fantastic from the outside (if the glaring, jealous looks of passers by were anything to go by), it was just slightly too cramped and noisy inside. Having said that, it was a well-organised and fun evening of great beer and good food. I can’t really ask for much more than that. A great idea – and, importantly, as you say – executed well. When it’s not, it comes across as opportunistic; so good to see something organised well. Nice to see Hogsback in there, too – not a brewery whose beers I’m massively keen on, but at least they are showing interest and support in beer of all kinds to all people. We had Timothy Taylor at Leeds Indy Beer Fest last year, as was Ossett, and when lined up alongside the likes of Kernel and Magic Rock, it does make you sigh a little, happily. Everyone playing together. Isn’t it nice? Yeah, these things can very easily come across as cash-in hipster magnets, especially as there are more of them all the time. This was a quality event, and as a result, I can now trust Craft Beer Rising to pull this kind of thing off again. And yes, it was a reassuring mixture of brewers. It’s what we all want to see, isn’t it? That stand at GBBF is called Bieres Sans Frontieres, but I think a real ‘Beers without Borders’ should be something like the above. Something that shows we can do without the divisions that have built up within the industry. Yep – and there are more and more ‘mainstream’ breweries out there readjusting their thoughts and, more visually, branding, to keep up. Some are letting their brewers flex their muscles with new recipes, one-offs and special editions. Sure, this might come off as cynical, but it does show a more homogenous side of the market coming out. A willngness to work together isn’t a bad thing.